Winter is coming and its starting to get chilly. Right about now is a great time to stock up on warm cozy knits. You can keep yourself warm and cozy with a cable knit headband. And plan ahead to have handcrafted gifts for all of your loved ones ready in time for the holidays. Craft your own double cable knit ear warmers this winter. These cuddly, soft hats will keep you warm on those chilly winter days. Each headband is approximately 3.5 inches wide. Order and download the printable PDF pattern here in my shop or on Etsy. This is a simple cable knitting pattern. I do not include a cable chart, as I find they confuse matters when clear written instructions are sufficient. I’ve written detailed instructions and a full pattern for each size. There are also plenty of full color pictures. To make these headbands, you’ll need to know how to knit, purl, slip stitches onto a cable needle, and do a Kitchener stitch. This is an intermediate skill level pattern. This pattern was designed using Caron Simply Soft Yarn, a widely available, super-soft acrylic fiber. Included in the pattern are instructions for all four sizes: Women’s size, Child’s size, Baby size, and Infant size. 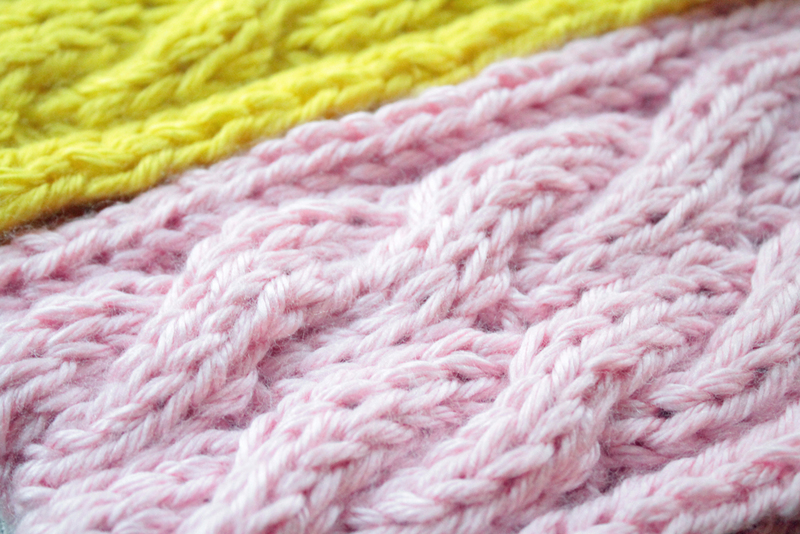 If you use the extra-soft acrylic yarn called for in this knitting pattern, the ear warmers can be machine washed separately on hand-wash cycle in cold water. Lay flat to dry. This pattern is only for personal use, gifting, and charitable donation of completed items. Please do not sell items made using this pattern. If you’d like to share the pattern, refer your friends to my Shop, so they may can get their copy. Please do not copy pattern and distribute it. You can download my cable knit pattern here in my Shop or from my Etsy store. It is available for immediate PDF download, so you can get started right away. If you’d rather not make this yourself, I can make it for you. Order a handmade cable headband from my Etsy shop. This handmade cable knit ear warmer headband will keep you warm and comfy on those chilly winter days. The double cable pattern will surround your head in comfy softness. And you can still wear a bun or ponytail while keeping your ears warm with this hand knit ear warmer. Each headband is approximately 3.5 inches wide. For more than three cable knit ear warmers, please request a custom order. The holidays are sneaking up on us! Don’t forget that a handmade gift is a wonderful way to share your love. Whether you DIY with the knitting pattern or have me handcraft it for you, a cable knit ear warmer can make an excellent gift.